A stunning, contemporary, ground floor apartment located within the East Cliff conservation area in the beautiful seaside town of Bournemouth. 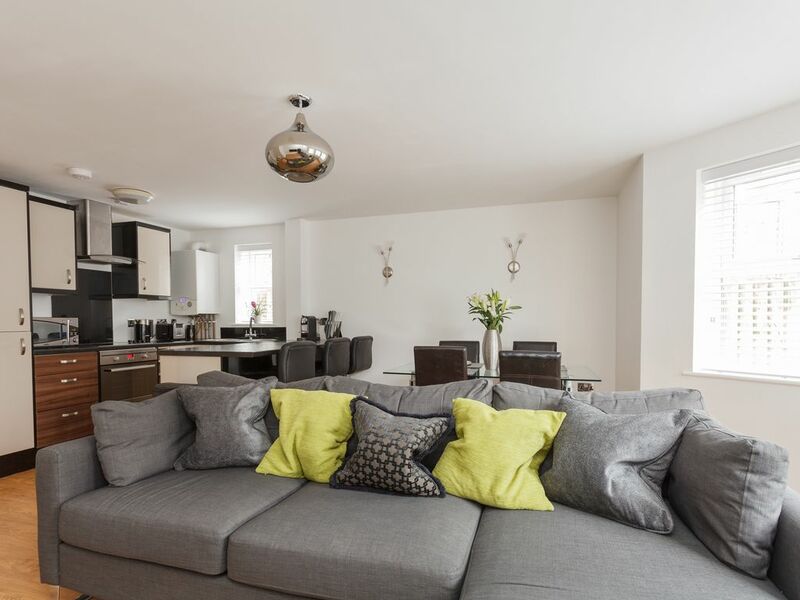 The apartment has been completely refurbished to a high standard. Features include a stunning 50" flat screen television, WiFi & Nespresso coffee machine for that fresh coffee first thing in the morning and a luxurious corner sofa which is perfect for relaxing on after a days sightseeing. This lovely two bed apartment makes an ideal holiday retreat offering all the features of a hotel suite but without the price tag. Internally, the property is lovely and spacious comprising of two bedrooms. The apartment is ideally located within easy walking distance of Bournemouth's stunning beaches, pier, town centre, train station, shops, restaurants and pubs. It's perfect for holidays, short breaks, visiting friends and relatives or the University. It's an ideal base for exploring Bournemouth, Poole, Christchurch, Sandbanks and the surrounding attractions. Bedroom 1 with a king size bed & en suite, bedroom 2 is a twin room with a zip and link mattress so can be converted into a super king bed on request. A travel cot is also available on request. There are 2 bathrooms (1 en-suite), entrance hall, open-plan lounge, dining area with table and chairs and stylish kitchen providing sociable living space. The fully-fitted kitchen comprises of oven, hob, dishwasher, washing machine and Nespresso coffee machine. The apartment also comes with the convenience of FREE parking which is an added bonus in Bournemouth. Great for couples, singles and family holidays. Weekly cleaning service provided on each Saturday for long stays. Please contact us for rates on booking greater than one week. We will consider bookings for long term lets, up to 6 months. Short stays 2-4 days out of high season. The apartment has been completely refurbished to a high standard for the 2016 season. New features include a stunning 50" flat screen television, Nespresso coffee machine for that fresh coffee first thing in the morning and a luxurious corner sofa which is perfect for relaxing on after a days sightseeing. .Bedroom 1 with a king size bed & en suite, bedroom 2 is a twin room with a zip and link mattress so can be converted into a super king bed on request. A travel cot is also available on request. There are 2 bathrooms (1 en-suite), entrance hall, open-plan lounge, dining area with table and chairs and stylish kitchen providing sociable living space. The fully-fitted kitchen comprises of oven, hob, dishwasher, washing machine and Nespresso coffee machine. Everything required for your holiday in this lovely apartment. don’t wish to drive. You can park your car right outside the apartment which is really handy. We stayed here with our 6 month old baby, being ground floor and parking right outside the apartment was ideal for our needs. Good communication with the host, Giovanni, who ensured a travel cot was setup for our arrival. The apartment itself was clean and spacious with all mod cons. Boscombe pier and beach is a short stroll away where we enjoyed a nice pizza from the Wood Oven whilst watching the sunset! Thank you for taking the time to leave a review Jane. Nice apartment would recommend for anyone planning to visit Bournemouth and nearby areas. Conveniently located close to beach. Good facilities provided within property. Thank you for taking the time to leave a review Balraj, I hope to welcome you back in the future. Dorset is a very popular holiday destination all year round. It offers beautiful rolling countryside and the Purbecks. Bournemouth with its award winning beaches and The New Forest nearby. Southampton, Salisbury and Stonehenge are all within reasonable travelling distance. Dorset features some excellent museums, with world leading centres at Bovington (The Tank Museum, telling the history of military vehicles), and the Russell Cotes Museum and Art Gallery in Bournemouth. Other museums include the Dorset County Museum in Dorchester, The Red House in Christchurch and the Royal Signals Museum at Blandford. Bournemouth is well situated on the South Coast, within easy reach of some the UK's best landmarks, including Old Harry, the Purbeck Hills, the New Forest and the Jurassic Coastline. Transport links make Bournemouth very accessible, due to having a local airport, train station, a good road infrastructure as well as being within close proximity to ferry terminals with routes to the Channel Islands and mainland Europe. The sandy beach, within easy walking distance from the apartment, offers snacks and ice creams, with toilet facilities and beach showers. The “zig zag” path that takes you to the beach is almost equidistant between the Bournemouth pier and Boscombe pier. A new beach restaurant has been opened at Boscombe Pier overlooking the new surf reef, as well as the existing pub/restaurant being refurbished. On Bournemouth pier there is a second floor restaurant which gives great views and family al fresco dining along with the aquarium, slot machines and fair ground rides. The Promenade itself gives access along the beach front to Hengistbury Head and Mudeford Quay to the east, as well going as far as Sandbanks to the west. Bournemouth is a traditional town with a large selection of shops, restaurants and cafes. Bournemouth Gardens being the centrepiece in the town centre leading to the beach and Pier. Also in the town centre are the BIC (Bournemouth International Centre) and the Pavilion which offer a wide range of evening entertainment, from music bands to theatre and comedy.